UI is designed in accordance with Google Material design guidelines. Main screen is shown on Pic. 3.2.. 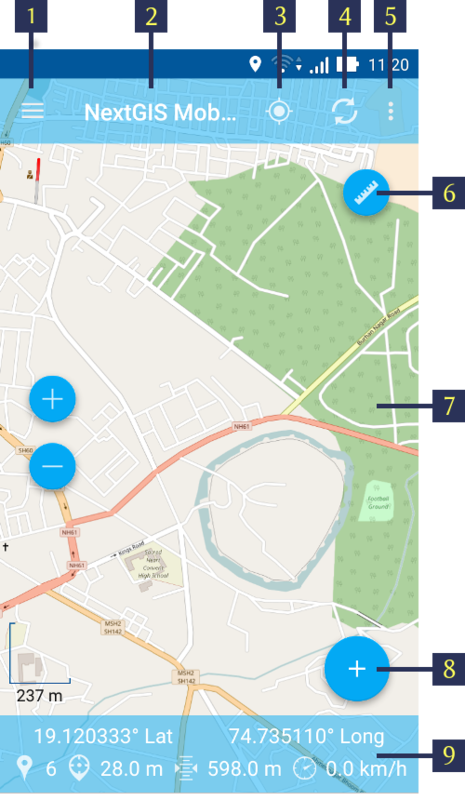 The numbers indicate: 1 - Layers tree panel icon; 2 - Application title; 3 – “Show my location” button; 4 - “Load/Refresh geodata” button; 5 - Contextual menu icon; 6 - Measuring button; 7 - Map screen; 8 - Main actions button; 9 - Status info panel. The number of buttons in top toolbar depends on your device screen size. If the buttons don’t fit into the toolbar they are moved to the contextual menu (item 5 in Pic. 3.2.). Depending on the size of the screen Status info panel can occupy one or two rows. A map (item 7 in Pic. 3.2.) is a set of raster and vector layers. The order and the visibility of layers are under control of layers tree (Layers tree). After a long hold of your finger on the vector layer’s geometry the map window turns to the select mode. Layers tree panel is designed to display the content of a map and to control visibility and hierarchy of map layers. Additional operations with layers are available from a separate layer contextual menu. Layers tree panel is shown on Pic. 3.3.. The numbers indicate: 1 - Layer type; 2 - Layer name; 3 - Layer visibility button; 4 - Add geodata; 5 - Layer contextual menu icon; 6 - Layer contextual menu items. 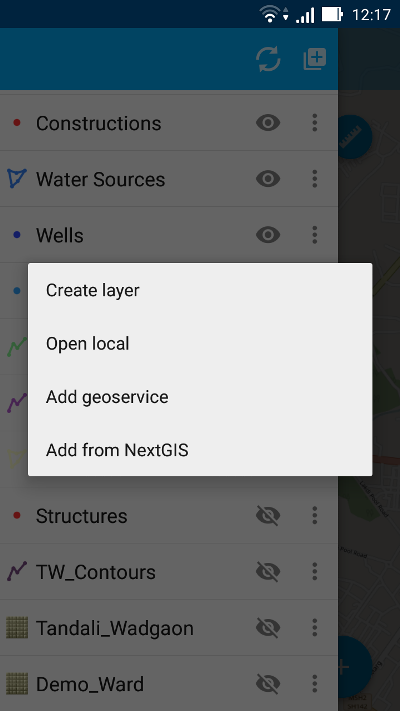 More information about geodata upload can be found in “Adding layers” section. Layer contextual menu depends on layer’s type (whether it is vector or raster layer). When you tap the Contextual menu button (item 5 in Pic. 3.3.) contextual menu items pop up as shown by item 6 in Pic. 3.3. By pressing “Delete” you not only remove layer from the map but also erase all its data from the local storage. Features table is designed to show and manage the contents of each vector layer in table format. To open Features table activate Layers tree panel and tap on the Contextual menu button next to the vector layer name (item 5 in Pic. 3.3.). This will pop up the contextual menu items as shown by item 6 in Pic. 3.3.. 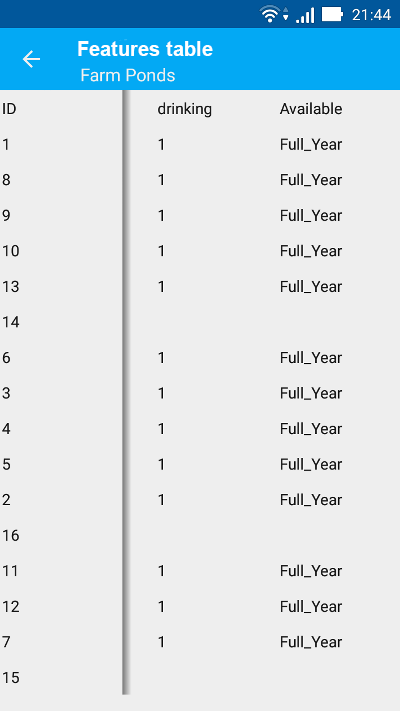 There you need to select “Features table”. Depending on the screen size the panel could occupy the whole screen or just the right side (in this case there is a map with a highlighted geometry of the current attributes on the left side). 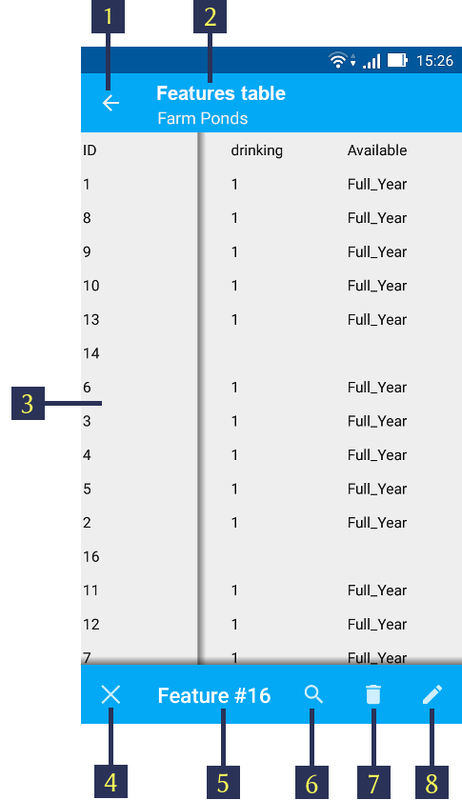 Features table opens as shown in Pic. 3.5. below. If you tap any record (row) in the table, the Features table toolbar appears at the bottom of the screen. This toolbar allows to manage features as shown below in Pic. 3.6.. 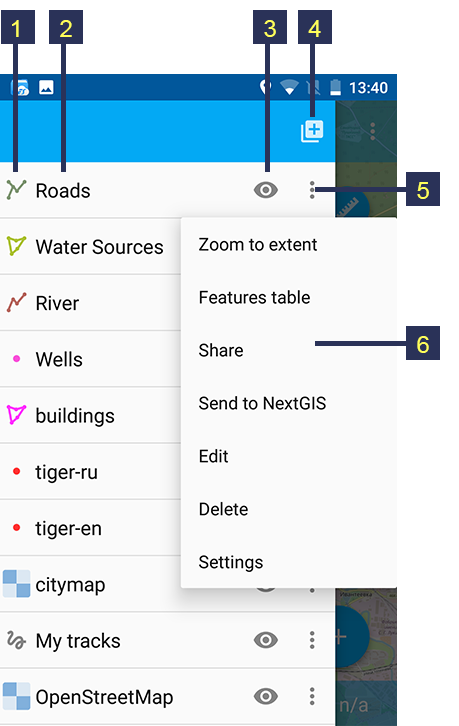 The numbers indicate: 1 - Close Features table; 2 - Layer name; 3 - Features attributes; 4 - Close toolbar; 5 - Selected feature ID; 6 - Show selected feature on the map; 7 - Delete selected feature; 8 - Open Features table editing form. If you tap on “Delete” button (see item 7 in Pic. 3.6. ), the system will delete the selected feature immediately. You will be able to undo the removal, but if undo action is not applied in 5 seconds after removal, the feature gets deleted permanently. Depending on the screen size Settings dialogue can fit into one or two panels. Settings dialogue is shown on Pic. 3.7. (one panel mode). “General” settings allow to change basic settings of the map (see Pic. 3.8.). 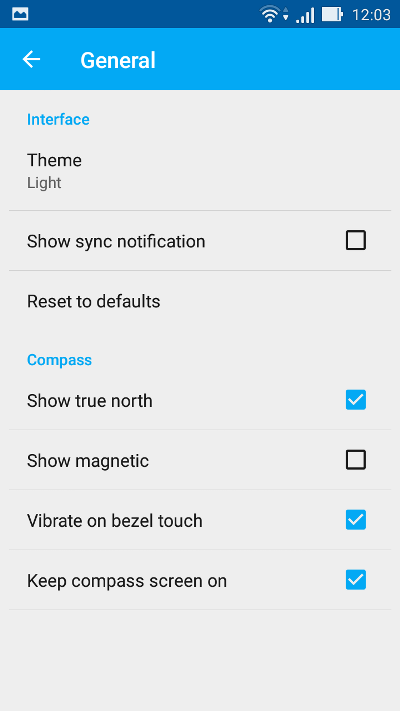 Here you can select the theme (Light or Dark) and tune up compass settings. 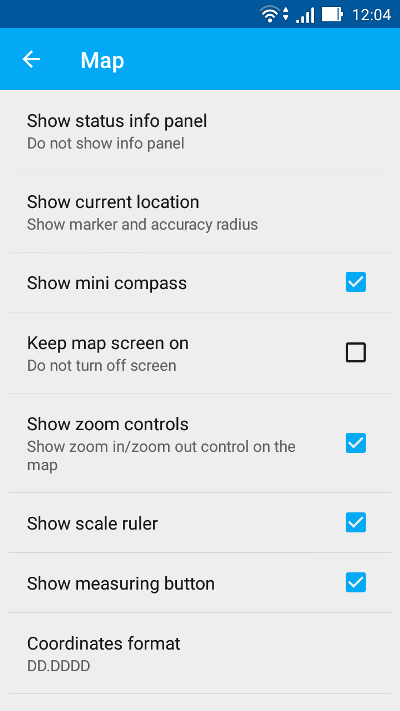 “Map” settings allow to change basic settings of the map (see Pic. 3.9.). For devices with several SD cards and Android 4.4 and higher, map path not on the main SD card can only be specified in the application home directory and its subdirectories (for example: Android/data/com.nextgis.mobile). This is also true for some devices without root access. Read-only folders won’t show up in path selection dialog. “Location” settings offer a few location specific settings (see Pic. 3.10.). 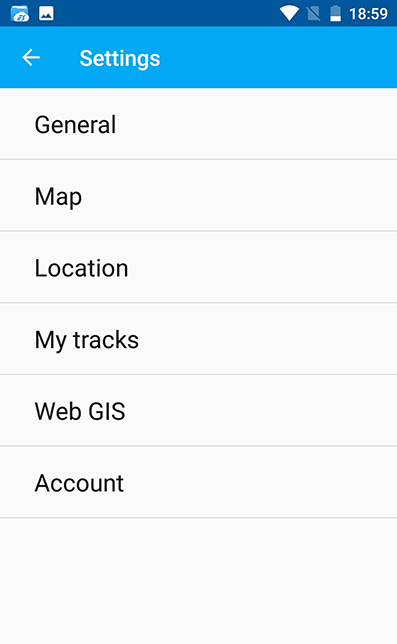 “Tracks” settings are similar to the location settings, but they are applied only for track recording. If you set value of the minimum update distance at more than 5 m, the operating system will start to smooth the track (remove outliers). From the Main screen itself you can access a couple of features useful in the field. To know your current location, just tap on the “Show my location” button (see item 3 in Pic. 3.2. above). This will show your current location on the map screen with a marker. If your Status info panel (see item 9 in Pic. 3.2. above) is switched on via appropriate Map settings (see Pic. 3.9.) you’ll also be able to view the relevant information there. 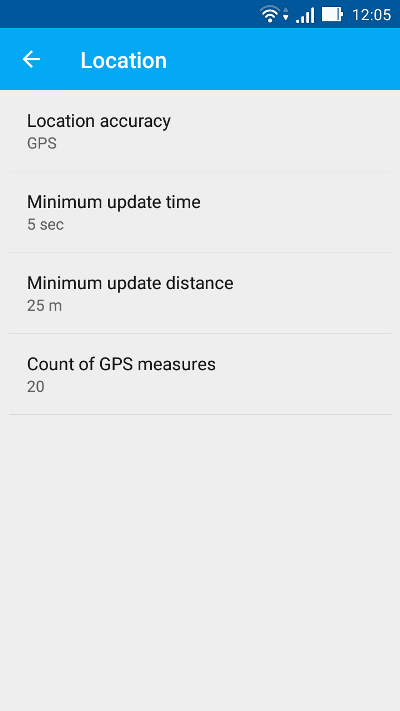 Your “Location” settings must be switched ON in your Android mobile settings. 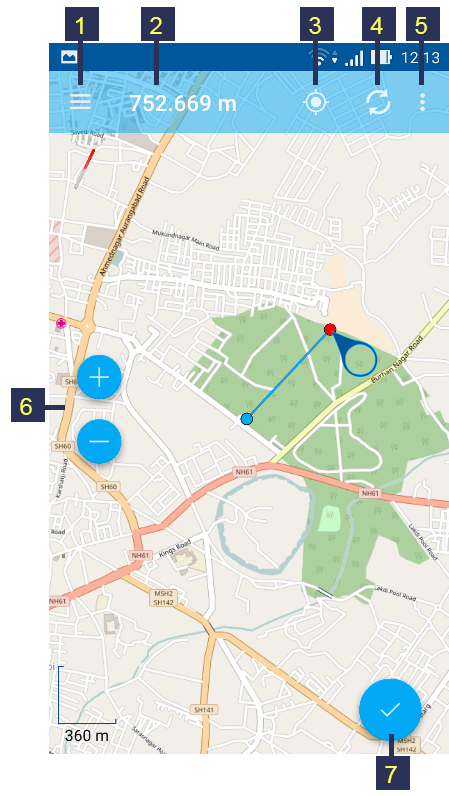 It is possible to measure the distance between two points directly on the map screen. Just tap on the Measuring button on Map screen (see item 6 in Pic. 3.2. above). Tap on your starting point (a new point in Edit mode will appear on the screen). Then tap on your finishing point (a second point in Edit mode and line between the points will appear on the screen). The distance between two points will be shown in Top toolbar. See Pic. 3.11. below for illustration. The numbers indicate: 1 - Layers tree panel icon; 2 - Measured distance; 3 - “Show my location” button; 4 - “Load/Refresh geodata” button; 5 - Contextual menu icon; 6 - Zoom controls; 7 - Exit Measuring mode. Position of any point may be edited by tapping on it and dragging it to the correct location. You can add additional points to measure distance of angled lines and smooth curves, as well as measure areas of the formed polygons. To exit Measure mode tap the blue tick button in the corner of the screen (see item 7 in Pic. 3.11.). To use this feature “Show measuring button” checkbox must be switched ON in Map settings (see Pic. 3.9. ).